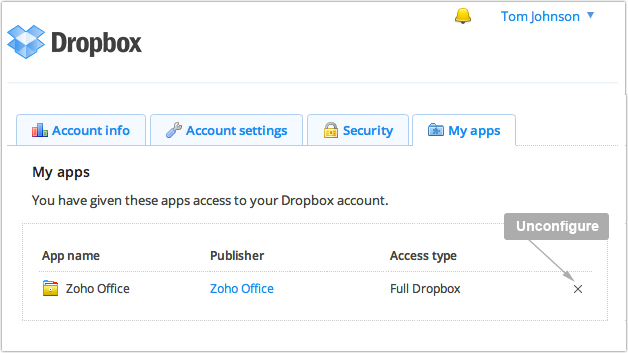 To be able to sync Dropbox files with Zoho Docs you first need to configure your existing Dropbox account with Zoho Docs. Click on the Dropbox icon at the top right hand side of the page. 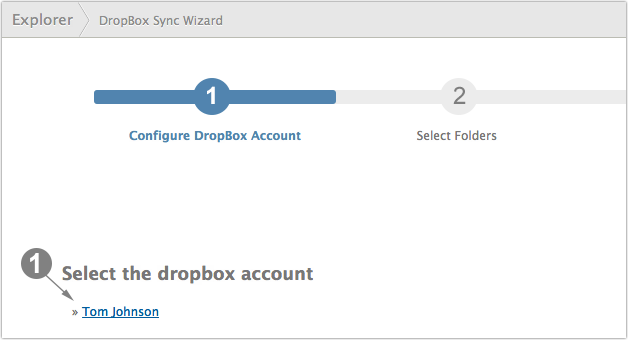 A Dropbox Sync Wizard page will open. 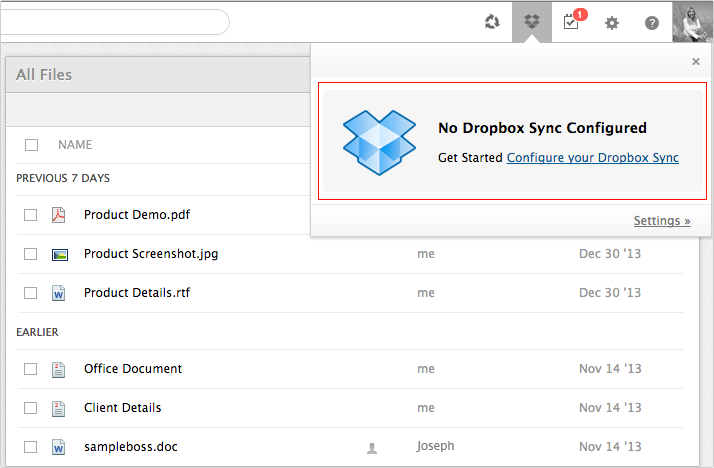 Click on the Configure Your Dropbox Sync link. A new page will open and you will see Add A dropbox Account link at the bottom. Click on the link and the Dropbox Sign In page will open in a new window. 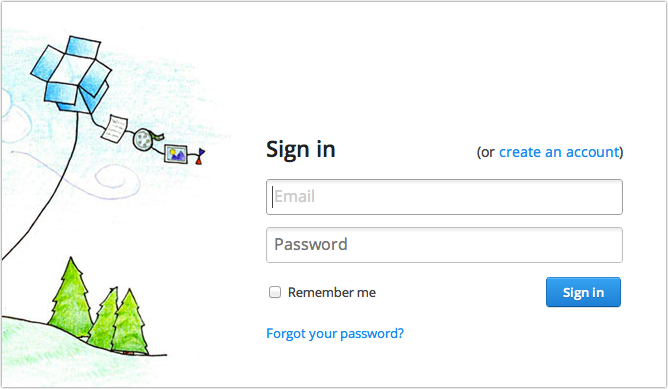 Once you Sign In a new verification page will open. Click on the Allow button. 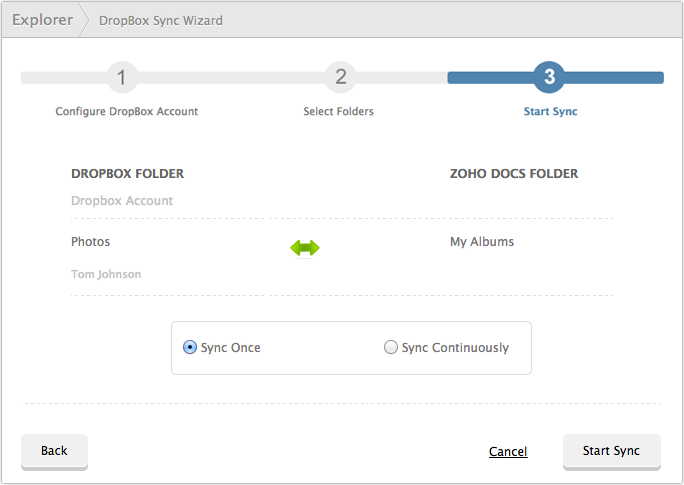 Once you have configured your dropbox account, the next step is to choose which folders in Dropbox you want synced with Zoho Docs. 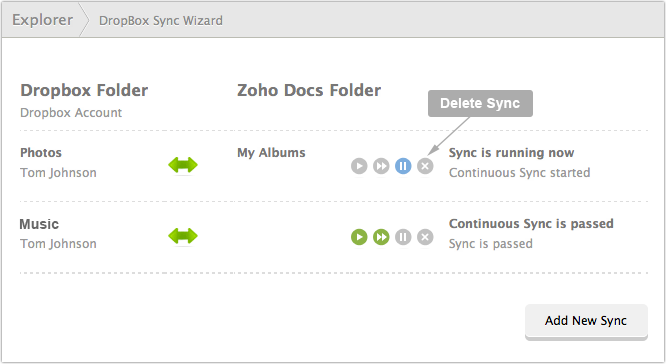 Note:Only the files within your dropbox folders will get synced with Zoho Docs. Sub-folders, and the files within them will not get synced. Click on your Dropbox username under Select the dropbox account. Your Dropbox folders will be listed on the left hand side and your Zoho Docs folders will be listed on the right hand side. Select the radio button next to the Dropbox folder you want to sync with Zoho Docs. Next, select the radio button next to the Zoho Docs folder to which you want to transfer you Dropbox files. If you want to deselecta folder, just click again on the selected radio button. Note:You can choose only one Dropbox folder to sync at a time. You cannot select multiple folders. 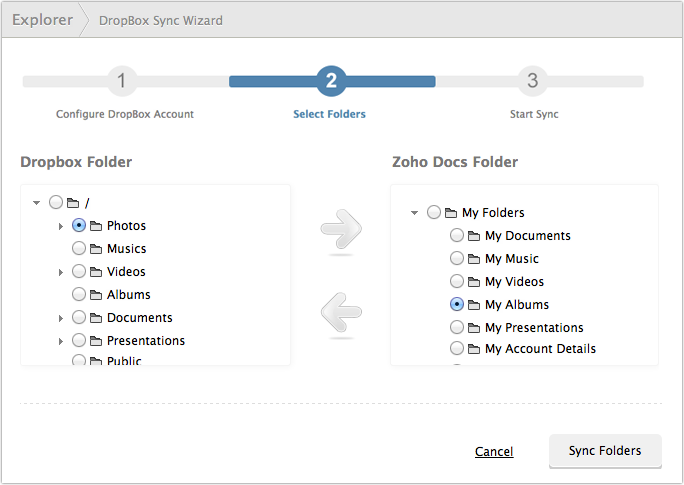 After selecting your Dropbox folders you can sync them with Zoho Docs. Once you have confirmed, which dropbox folders you want to sync click on the Sync button. A new page will open displaying the Dropbox folders you have chosen to sync. Select the radio button next to Sync once or Sync continuously. Sync Once: The Dropbox folder will get synced with all the files only at the time of the current sync. 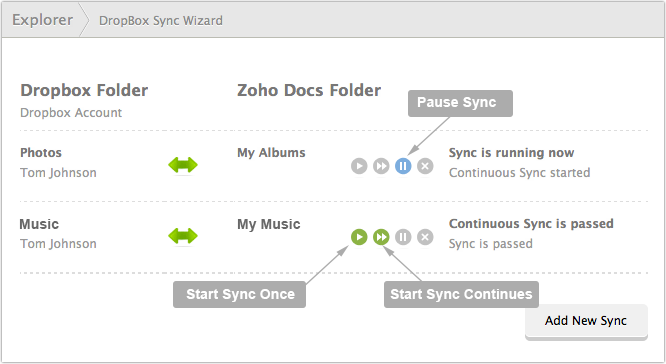 Continuous Sync: Every time a file is added to the Dropbox folder the file will automatically be synced in Zoho Docs. Click on the Start Sync button if you want to sync the selected folders or click on the Back button if you want to go back to the folder structure and select another folder. On clicking on the Start Sync button a page will be displayed with the Dropbox folder that has been synced. If you want to sync another folder click on the Add New Sync button. Note:You can sync only one folder at a time. You can carry out various actions on your synced folders like pausing them, changing one time sync to continuous sync and vice versa or you can delete the synced folder and sync another one. Click on the Dropbox icon in the Explorer bar. A list of all the synced folders will be displayed. Click on the Pause icon to pause syncing of the folder. The icon will change to grey to imply syncing has been paused. To resume syncing click on the Pause icon again. The icon will be turn to blue to imply that syncing has resumed. Click on the One Time Sync icon to stop syncing of the folder. The icon will change to grey to imply syncing has been stopped. Click on the Continuous Sync icon. The icon will turn to green to imply that Continuous Sync has been enabled. Click on the Continuous Sync icon to stop syncing of the folder. The icon will change to grey to imply syncing has been stopped. Click on the One Time Sync icon. The icon will turn to green to imply that One Time Sync has been enabled. Click on the Delete icon to delete the Dropbox folder. Note:The folder you delete will only be deleted from Zoho Docs and will not be deleted from your Dropbox account. Click on the drop down arrow next to your Dropbox username. In the drop-down menu click on the Settings option. Your Dropbox settings page will open in a new tab in your browser. Click on the My Apps tab. Zoho Office will be listed under My Apps. Click on the cross sign. You will get a confirmation pop-up. Your Zoho Docs account will be unconfigured and you will no longer be able to sync your Dropbox files.